Chip maker Advanced Micro Devices Inc. released details Wednesday on its forthcoming Ryzen chip, including pricing that has the potential to set off a price war with its big rival, Intel Corp.
AMD AMD, -1.47% said the first three chips based on its highly anticipated Zen architecture will be launched March 2 for the desktop PC and gaming market, with the most powerful chip in the lineup priced at half of what Intel INTC, -0.03% charges for a similarly configured chip. Investors were enthused by the first concrete news of the chip family, with AMD’s shares rallying almost 2%. Chief Executive Lisa Su said at an event Wednesday in San Francisco that AMD had one goal in mind when it was developing the new chips. “We wanted to disrupt the PC market, we wanted to bring innovation, choice and performance to as many people as possible,” she said. Its highest-performance chip, called the Ryzen 7 1800X, with 8 cores, is priced at $499, which the company compared to a similarly configured 8-core, 16-thread Intel Core i7-6900K, at $1,000. “More performance, half the price,” Su said. AMD’s other two Ryzen chips are priced slightly below Intel’s chips, she said. The Ryzen 7 1700X will be priced at $399, versus Intel’s pricing of a comparable chip for $425, and the Ryzen 7 1700 will be priced at $329, versus $350 for a comparable chip from Intel, AMD said. Patrick Moorhead, principal analyst with Moor Insights & Strategy, said he believes Intel will take a wait-and-see approach, and focus on the high performance of its own chips, possibly increasing the clock speeds of its own chip offerings, rather than hurt its profit margins by lowering prices. In the past, Intel and AMD have sparred over pricing, but that was in the days of a much stronger PC market. It’s feasible that now the chip rivals will engage instead in a performance war over clock speeds, which have become less of a focus for most consumers but are still important to videogamers. AMD shares have soared it the past few months as investors have big hopes for the company’s new chip family, which Su said was “truly our best product lineup in over a decade.” But the real hope for investors is AMD’s foray again into the server and data-center market, where as Bernstein Research analyst Stacy Rasgon noted, the company currently has less than .2% market share. “The biggest incremental opportunity could be in servers, but that takes longer,” he said. AMD shares have gained 625% in the last 12 months, while Intel shares have gained 25%. The S&P 500 SPX, -0.03% has gained 23% in the same time frame. 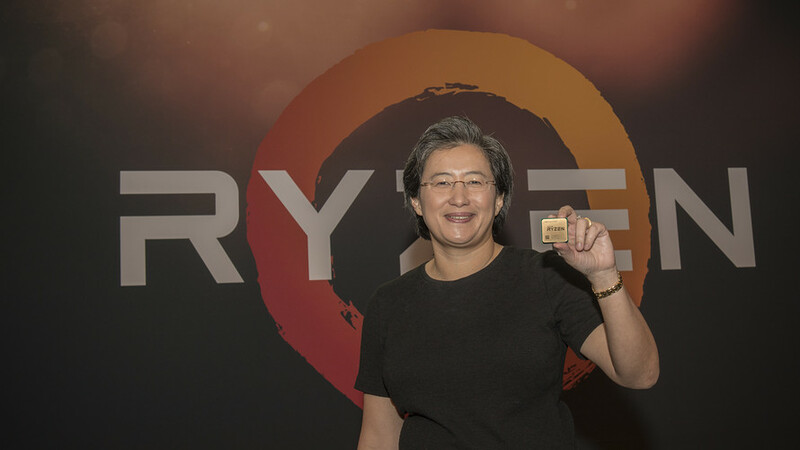 AMD CEO Lisa Su shows the company's forthcoming Ryzen chip for desktops and gaming PCs. AMD's Ryzen high-end Summit Ridge CPUs have been priced—and it looks like Intel better batten down the hatches, or be ready to slash its prices to compete. At the top end the Ryzen 1800X will cost $500 (~£500), versus $1,100 (~£1,050) for the Intel Core i7-6900K that AMD is putatively pitching it against. Further down the stack there's the Ryzen 1700X for $400, which AMD is comparing against the $450 Core i7-6800K, and the $330 Ryzen 1700 versus the $350 Core i7-7700K. All of the chips are available to pre-order from Newegg. Update: UK pricing has been confirmed, at slightly less than £1-to-$1: £490 for the Ryzen 7 1800X, £390 for the 1700X, and £320 for the 1700. The chips are available to pre-order from all your usual component stockists, with a release date set for March 2. Notably, all of the Ryzen parts feature 8 cores and 16 threads (8c16t), which can only currently be matched by the Haswell-E i7-5960X (~$1,100), Broadwell-E i7-6900K (~$1,100), and a number of even more expensive Xeon chips. The 6800K has 6 cores and 12 threads, while the 7700K is your standard 4c/8t desktop chip. Today AMD also locked down the speeds and feeds for the Ryzen 7 chips. The 1800X has a base clock of 3.6GHz, boosting to 4GHz; the 1700X is 3.4GHz and 3.8GHz, and the 1700 is 3.0GHz and 3.7GHz respectively. The top two parts have a TDP of 95W and won't be bundled with a cooler; the lower-end part clocks in at 65W and will come with a bundled "Wraith Spire" cooler. At Ryzen's first preview in December 2016 AMD touted that the top-end 1800X chip could out-perform Intel's i7-6900K by about 10 percent in multithreaded workloads. AMD also asserted that the Ryzen chip had a TDP of just 90W, versus 140W for Intel. Obviously, if those claims bear out, then $500 will buy you one hell of a chip. For most of us, though, the more interesting battle will be at the lower end. Will the Ryzen 1700 out-perform the Kaby Lake i7-7700K? Presumably the Ryzen's 8c/16t setup will thrash the Intel chip in heavily multithreaded workloads. But what about games and productivity? AMD said in August last year that it was targeting a 40 percent IPC uplift over Excavator for Ryzen, which would just about place it within the Intel Core ballpark. At an event in San Francisco last night, AMD CEO Lisa Su said that they actually surpassed their target: Ryzen's IPC is 52 percent above Excavator. But how will those figures bear out in real usage? The good news is that Ryzen's launch is Real Soon Now™: March 2, to be exact. AMD is presenting Ryzen at the Game Developers Conference in San Francisco on March 2, and the chips, motherboards, and boutique PCs will go on sale the same day. AMD told us in San Francisco that March 2 is a hard launch: product will be available on that day, at the price points listed. We have a Ryzen chip in-hand now, and will have benchmarks and real performance figures in time for launch day. In the mean time, you might like to read more about Ryzen's AM4 motherboards, or some details about the Ryzen (née Zen) CPU architecture. This is not a Zen chip. I just included it because, well, the original AMD Athlon holds a special place in my heart. It's also the last time that AMD challenged Intel for the performance crown. Click through to the rest of the Zen slide deck. InF! Here are some semi-informative and rather vague slides on the Zen CPU architecture. Some of these details are old; some of them are new for August 2016. You know when AMD’s Ryzen is launching, how much it’ll cost, and you even have a pretty good idea of its performance. But you might not know why AMD dropped the original Zen name for Ryzen, so we asked. And it all begins with what AMD couldn’t do with the brand. As John Taylor, corporate vice president of marketing for AMD, describes it, AMD was between a rock and a hard place. Mike Clark, an engineering fellow at AMD who led the Zen architecture development, had dubbed the architecture “Zen” for the balance it struck between various aspects of the design. Fans who had followed Zen’s development would buttonhole AMD execs and rave about the Zen name: “‘I love Zen...there’s something about it I’m just connecting with,’ they’d say,” Taylor said. The problem was that AMD simply couldn’t trademark Zen. Under U.S. law, trademarks need to be “strong” and unique, and there was already a wealth of Zen-named products out there, even among AMD’s own customers (like Asus and its ZenFone). So AMD had to look elsewhere for inspiration. Like most major companies, AMD works with specialized naming agencies—yes, they exist—specifically to build a roster of future, trademarkable brand names. At the same time, a cadre of in-house space fans began thinking in another direction—specifically the New Horizons probe that had flown by Pluto in mid-2015. That inspired AMD to give the slightly different name of “New Horizon” to the December, 2016 webcast where AMD formally unveiled the Zen architecture. “And every time we looked at it, we said that word looks fast and it looks like it could be on the side of a spaceship going to Mars,” Taylor said. AMD had a winner. There’s more behind Ryzen’s name, though—literally. The brushed circle behind the logo is an enso, either a closed or partially open circle in Japanese calligraphy. Naturally, there’s a Zen connection: A closed circle represents perfection, while an open circle symbolizes further development and growth. AMD sees the enso, a “single unbroken creative stroke,” as representative of the human creative spirit, Taylor said. “There really are tons of people doing amazing things on the Internet every day,” he said. The final element is the font, which you might have thought was simply added to express the brand name. Nope. Even that has a significance, Taylor said. Whether it be Zen’s success, its cachet, or just the relief of finally getting some revenge against rival Intel, AMD engineers have latched onto Ryzen like nothing before, Taylor said. That’s made Ryzen merchandise a hot ticket even within the company. 0 Response to "AMD’s Ryzen chips could spark price (or performance) war with Intel"